There are plenty of reasons why you should fall in love with Merino wool. Wool has the ability to do things such as naturally breath and manage the amount of moisture that is held within the fabric of a piece of clothing. It insulates incredibly well because wool can hold as much as 30% of its weight in water. This makes it one of the most absorbent natural fabrics that you can purchase. Since wool manages moisture so well, it is resistant to odors and it even protects your skin from UV radiation naturally. However, wool has a few drawbacks that have given it a bad name when it comes to clothing. For example, many people find that wool is scratchy and stiff. This is because wool has a thick fiber structure that makes it harder to bend and although wool is much stronger than other fabrics such as cotton, it isn’t always comfortable to wear. This is where Merino wool comes into play. Merino sheep are native to the country of New Zealand and unlike other animals, they produce a wool that has a much thinner fabric strand. This is what makes Merino wool great for socks because you get the insulating capability of wool as well as its strength while you still get the comfort of fabrics such as cotton. Many people love to wear socks that are made from merino wool for these reasons. Socks that are made from Merino wool will help keep your feet warm and toasty while you playing or working at cold outdoor temperatures. You can even wear socks that are made from merino wool year round because you only need to get a thinner weight sock. Socks that are made from merino wool feel much softer and more comfortable than other wools socks so these are a great choice when you are looking for high-quality socks. How many times have you found a pair of running socks that, after a few strides, the sock slips down, causing an uncomfortable running experience? This happens when you don’t wear Rockay Socks. Made from premium, high-quality materials and designed to help further accelerate an individual’s capabilities, running has never been this enjoyable. Typically, sock makers do not focus much on the ideology of safety. This company intentionally crafted this product to ensure that all runners were safe, whether during the day or at night. 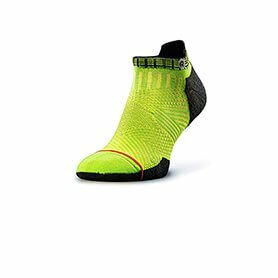 With a reflective logo on for night-time running to a protective heel tab to prevent any slipping, each runner will be in control of their experience without any worry. When it comes to any type of sock, the materials used to make it are crucial. This brand utilized organic Merino Wool, which if you are not familiar, is optimal for keeping your feet cool in the summer and warm in the winter. As far as cost and value are concerned, these socks are priced slightly higher than other running socks. Now, this is not a bad thing, which sometimes consumers tend to believe. What you need to consider is that these are probably one of the most valuable products on today’s list. They are infused with value in the very seams of the socks. The truth is, this sock is for the true runner. Consumers will have the opportunity to select from a wide variety of different colors and designs, for both men and women. These socks are, without question, some of the most comfortable running socks on the market today, thanks to the 100% Organic Merino Wool material. The material used is also highly ventilated, which helps minimize the build-up of sweat while running. The heel tab on the sock will ensure that whether running or walking, it will not slip or slide. This product is slightly more costly than other socks on today’s list. Darn Tough socks are a great brand of merino wool socks that are perfect for when you are either working hard or playing hard. They are made from a fine merino wool which will help you stay warm yet still feel soft and comfortable while you are wearing the sock. This comfort allows you to wear the socks all day long while you enjoy the best parts of your work day or day on the hiking trail. One of the best parts of these socks is that they are naturally antibacterial and antimicrobial. This will help reduce odor that would otherwise be produced by foot sweat which can lead to smelly socks and shoes after you have worn the socks all day. Another great feature that is found in these socks is that they do not have any seams. This helps to make the socks into a more durable product and it will also improve comfort because you won't feel the seams rubbing against your feet. When you are shopping for socks, you will notice that these socks have a price that is slightly higher than the average price for merino wool socks. The higher price comes from the high tech design that emphasizes comfort and durability. These socks are made from a blend of merino wool and lycra spandex which helps them feel soft. They have a full cushion in the entire sock area so that your feet are supported and padded. There do not slip or bunch up which prevents your feet from developing blisters and improves comfort. The manufacturer puts an unconditional lifetime guarantee on the socks so you can trust the quality. They naturally product you from odor-causing bacteria and microbes that cause your feet to smell bad. Some reviewers have reported that the socks feel too tight and can feel like a compression sock. Other users have reported that the socks do not keep them as warm as what they expected. 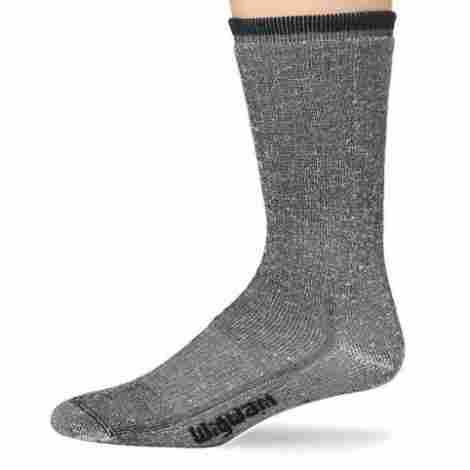 The hiker socks made by Wigwam are a great pair of socks that you can wear all your round. They feature a blend of merino wool, nylon, elastic, and acrylic so that they feel comfortable and yet cozy warm while you have them on. The medium of the weight of the socks will help make sure that your feet stay warm in cooler weather without getting too hot in warmer environments. If you are looking for additional arch support then these are a great pair of socks for such a purpose. The arch of the sock includes elastic rubber which gives the socks a compression fit around your foot arches for additional support. There are no seams in the toe area of the socks which helps to improve the durability of the socks. You will not need to worry about your toes poking out of the socks while you are wearing your wigwam socks. You will see these socks sold at a price that is much lower than the average price. This makes the socks into a great value because you will find that there are many premium features in these socks without having to spend much on them. The socks are made from a blend of merino wool, nylon, elastic, and acrylic so they feel great. You wash these socks in the washing machine which makes it easy to clean them when they are soiled. There is an elastic band around the arch area of the socks which provides you extra support. They have a stretch fit that contours around your foot so that they do not slip. There is a ventilation channel near the arch area which helps to remove foot sweat from your feet. Some reviewers have reported that the socks got thin after only six months of use an wore out quickly. Other users have reported that the size of the sock is not accurate and that it is too tight. If you are somebody who loves to be active then you will love these performance socks that are made by Danish Endurance. They have the perfect blend of merino wool which will help keep your feet warm in cold weather and cool in hot weather. This makes the socks into a great choice for when you are going to be running, jogging, or playing sports. The socks are also great for wearing casually. These socks feature a blend of merino wool, acrylic, polyamide, and elastane. The merino wool is naturally breathable yet insulating but the rest of the fabric blend helps make the socks moisture wicking and soft so that you have the best pair of active socks. The fibers used to make the socks are naturally anti-bacterial. That means that you will not need to worry about your feet, socks, or shoes smelling bad from sweat and moisture because the socks prevent the growth of odor-causing bacteria. You will see these socks sold at a price that is lower than the average price for merino wool socks. They are a bargain buy because you will get many of the features found in higher priced socks without spending a lot. The socks have mesh ventilation zones that allow air and moisture to escape away from your feet. There is extra padding on the heel and midsole of your feet which helps to cushion your feet. 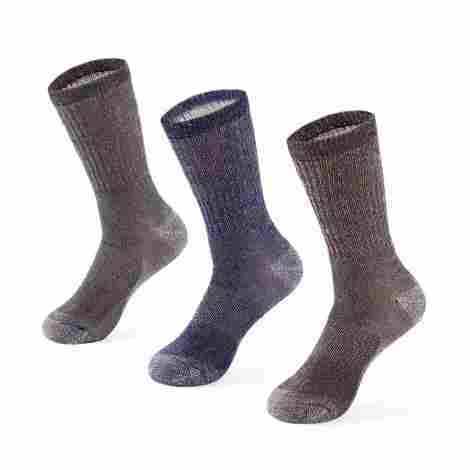 The socks are made from a blend of wool and other moisture reducing fabrics so that you feel dry. They are naturally anti-bacterial so that you do not need to worry about foot sweat or odors. You can use these socks as athletic socks or wear them during casual occasions as well. Some reviewers have reported that they do not have enough wool so they do not insulate well. Other users have reported that the socks start to come apart at the seams after using them. 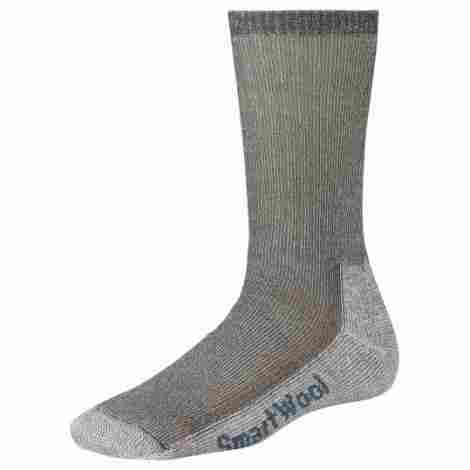 When you are looking for a pair of socks that will keep your feet warm in winter weather, then you should look no further than SmartWool brand socks. SmartWool pushes clothing technology to the limit by blending merino wool with other fabrics os that your toes will never feel cold while you are wearing a pair of these socks. They look great and will match just about any outfit so you can stay warm in style. You do not need to worry about the seams of the socks rubbing against your skin and chaffing your feet. That's because SmartWool socks have flat seams that you will not even notice are present while you have the socks on. 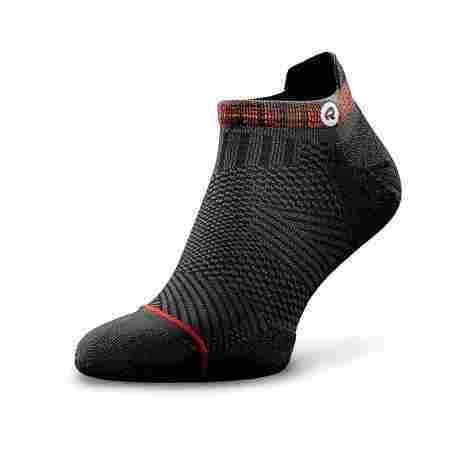 Nobody wants to feel like their feet are hot and sweaty while they have a pair of socks on so SmartWool uses a blend of merino wool and other fibers to make a pair of moisture wicking socks that you will love to wear. 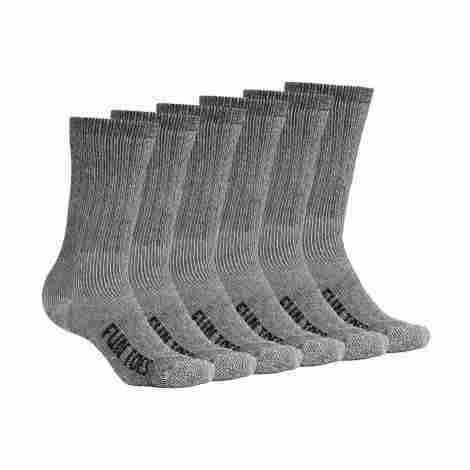 These socks have a price that is considered to be an average price for merino wool socks. 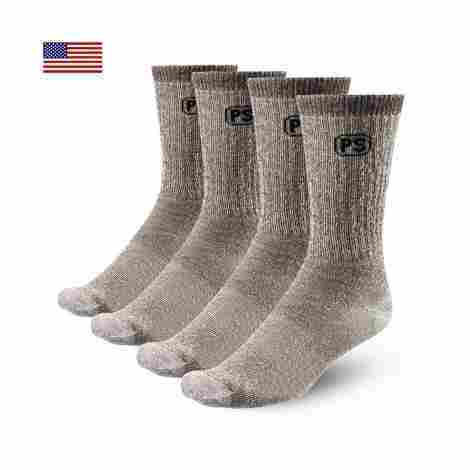 This makes them into a great value because you can get a pair of high-quality wool socks without having to pay a premium amount for them. The socks are made from a blend of 66% merino wool, 33% nylon, and 1% elastane. They have flat seams in the toe areas so that you will never have to feel the seams. The arch area of the sock is elasticized so that you get better arch support from the socks. The socks are naturally odor resistant so you do not need to worry about smelly shoes or socks. They breathe well and wick away moisture so that your feet feel comfortable while you are wearing them. Some users have reported that the fit of the sock is not accurate making it hard to find the right size. Other reviewers have experienced problems with the socks not holding up after wearing them for a few months. People socks are made for everyone regardless of who you are or what sort of activities you love to participate in. These are the best socks for general purpose use because they offer plenty of cushioning and support in the foot area so that you feel comfortable all day long. You will also love how quickly the socks dry so you do not need to worry about your feet feeling sweaty. These socks dry quickly which means that they will not keep your feet hot and sweaty while you are wearing them. Since they dry fast, you can also hang dry them so that they last longer and avoid the drier. The socks have a shape that is contoured to your feet. This provides you with the maximum amount of comfort and support while you are wearing the socks because they have a fit that is just perfect for anyone's foot. These socks are sold at a price that is higher than the average for merino wool socks. The higher price is due to the socks being made from a high blend of merino wool, unlike other socks that use a lower concentration of wool. This brand of socks features a blend of 71% merino wool, which is a high concentration of wool. They are blended with nylon so that they do not scratch or itch while you are wearing them. The socks dry quickly which helps keep your feet dry and makes it easy to line dry them also. The footbed of the sock is contoured to your feet so that they feel more comfortable. Impact on your feet will be reduced by the extra cushion areas located on the footbed. It is not recommended for you to dry these socks in the drier but line dry them instead. Some reviewers have reported that the socks developed holes in as little as fifteen months of use. If you are someone who loves to spend a lot of time outdoors on the hiking trail, then you will love these hiking socks that are made by Buttons and Pleats. They feature a luxurious fabric blend of 65% merino wool that makes them feel strong and comfortable while you are wearing them. The design of the socks helps support and cushion your feet so that you can walk all day long in them. Merino wool is known for its strength and these socks add to that strength by reinforcing the heel and toe areas of the socks. This helps the socks last for a long time so that you get your money's worth. Sometimes socks fall down your leg as they stretch and contract while you are wearing them. This brand of socks features a smart design that helps keep the socks in place no matter how long you have been wearing them. You can expect to pay a price that is slightly lower than the average price for these merino wool socks. They are an excellent value for the price because you do not have to pay a premium price to get an excellent value. The socks have a no-slip design that helps prevent rubbing and chafing while you are hiking. They do not bunch up while you are wearing them either so that they stay comfortable. The 65% merino wool blend and reinforced areas of the socks make them exceptionally strong and durable. You can wash these socks in the laundry machine without worrying about them shrinking or getting ruined. The socks feature extra padding in the toe and heel areas which provide you with extra cushion. Some reviewers have reported that the socks are not moisture wicking and make their feet sweat. Other users have mentioned that the socks are not as durable as advertised and they wear out quickly. Fun Toes makes a merino wool sock that is great for just about any purpose. That means that regardless as to whether you are active or inactive, these socks will be great for you. You can wear them on a hike or simply around the office and they will continue to look and feel great. The merino wool blend socks help your feet stay warm in the winter time so they are great for the cold seasons. These socks are reinforced in the toes which means that you will not need to worry about them developing holes. They have been designed to be strong and long-lasting so that you can wear them years at a time. 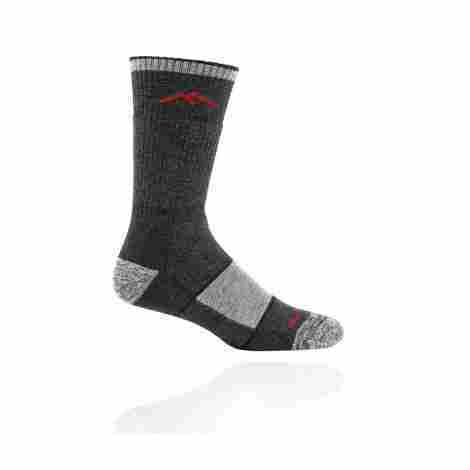 The socks are made from a blend of merino wool, nylon, polyester, and spandex which provides you the strength and insulating properties fo wool while giving you a soft and elastic feel that you will absolutely love to have on your feet. You will see these socks sold at a price that is slightly higher than the average price for socks. The premium price is due to the high tech blend of fibers that have been used to make the socks so that they are long lasting and comfortable. The socks are made from a blend of fibers that gives you the benefits of wool without feeling itchy. They also have odor reducing features that will help keep the socks and your feet smelling fresh. Your arches will be supported by the elastic band that is located in the arch area. The socks are lightweight and stretch to conform around and support your feet while you are wearing them. They have reinforced toe areas which keep holes from developing in the toes of the socks. Some reviewers have reported that the socks are too thin and do not last as long as they should. You will need to air dry these socks after you have washed them because machine dry is not recommended. 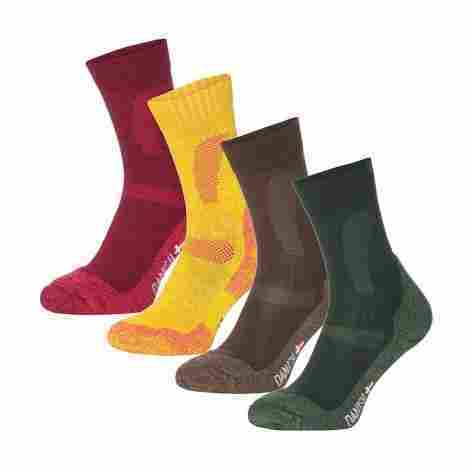 People who spend a lot of time walking or hiking will love the trail socks that are made by Kirkland Signature. The socks feature a great blend of merino wool that will help keep your feet warm while breathing well and resisting odors. They are not too thin or too thick so that they are great to wear year round. Anytime you want to go for a walk in comfort, you should consider wearing these socks. You will not need to worry about your feet feeling hot and sweaty in these socks because they have been designed to be breathable and moisture wicking. This will help your feet stay nice and dry while you walk in these socks. You can wear these socks with just about any kind of shoe or boots because they are midweight. That means that the socks are not too thick or too thin which makes them great with just about any kind of footwear. These socks are sold at a price that is slightly below the average price for merino wool socks. They are a great value for the price because you can save a little bit of money while still getting a high-quality pair of socks. Meriwool makes a great brand of general purpose wool socks that you can wear all day long. The blend of wool with other fabrics helps to keep the socks from getting itchy and scratching your feet. You won't even notice that you are wearing the socks thanks to their ability to properly regulate temperature around your feet and provide you with comfort and support. This makes them enjoyable to wear for any purpose. Sometimes socks that are made of wool can feel stiff and itch your feet. However, these socks are made with a blend of merino wool that will not cause your feet to itch and will provide you with all-day comfort. Breathability is important for socks because if the socks do not breath then your feet will feel hot and sweaty while you are wearing the socks. Merino wool is known for its excellent ability to breathe and keep your feet feeling great. These socks have a price that is lower than the average price for merino socks which makes them into an excellent value for the price. You can enjoy a great pair of socks while you have the opportunity to save some money on them. These socks naturally wick moisture away from your feet which allows your feet to feel dry and comfortable. They naturally resist bacteria and other microbes that are known to cause foot odor. The toe seam on the sock has been smoothly knitted so that you do not feel it. They are made from a blend of wool and other fibers that keep the socks from itching. You can wash these socks in the washer and the dryer which makes them easy to launder. Some reviewers have reported that the socks shink when they have been machine washed and dried. Other users have mentioned that the socks feel too tight and constrict their feet and toes. Merino wool socks are popular for many reasons. Many people love them for their looks, durability, and how great they feel. None of this should come as a surprise because merino wool is known for all three of the above features as well as many more features. For example, wool has strong fibers which help is resist tearing or wearing out due to friction. This makes merino wool socks into a great choice for people who are active and enjoy sports. Other people love merino wool for its ability to keep them warm. Wool has an excellent moisture capacity which means that it will insulate better as it gets wet. This works well with your feet since feet tend to produce plenty of sweat that gets absorbed into the wool fibers and help them insulate. However, you will not need to worry about your feet or socks smelling bad because merino wool naturally resists bacteria which is the source of foot odor. On warmer days, merino wool naturally regulates its temperature and will release heat and moisture away from your body so that you do not get too hot. Other people love merino wool because it feels soft on their skin. Other species of wool tend to have thick fibers that are stiff and will cause itching against their skin. This is the reason why many people do not like to wear clothing that is made of wool. Merino wool solves the problem by having thinner fibers that make it feel soft. There are plenty of other reasons why you may want to choose to wear socks that are made from merino wool, but no matter your reason, you can count on the socks feeling great! When you are purchasing a pair of merino wool socks, you will want to pay attention to the overall thickness of the sock itself so that you get the right sock for your needs. Socks come in a variety of different thicknesses because some socks are meant for use in warmer temperatures while other socks are intended to be used in cold temperatures. It is important for you to match the sock to the season that you plan on wearing the socks so that you feel comfortable while you are wearing the socks. If the socks are too cold or too warm, you will most likely feel dissatisfied with the socks which is something that you are trying to avoid when you are making a purchase. The thickness of a sock is described in terms such as heavyweight, mid weight, ultra-light, or lightweight. While the terms may seem subjective, you will easily be able to tell how thick the socks are by simply looking at them. While you are looking at the thickness of the socks, you will need to keep in mind that the thickness does not refer to the fibers that are used to make the socks but rather simply the overall thickness of the sock itself. In other words, a heavyweight sock simply uses more fibers to make the sock rather than using thicker fibers themselves. Merino wool socks typically fall on the thicker side when it comes to thickness of the socks. This is because merino wool itself is intended to keep you warm in cold weather. As a matter of fact, merino wool is capable of absorbing an impressive amount of moisture for the thickness of the strands, which means that the more that you sweat, the warmer the socks will start to feel. As the socks retain moisture, the fibers of the wool work with water to create a thermal barrier that prevents heat from escaping from around your feet. This is why clothing that is made from merino wool is popular in cold environments. Therefore, if you are going to walking in hot summer temperatures, you will need to find the thinnest merino wool socks that are available or look for blend socks that only use a small percentage of merino wool in the blend. Wearing merino wool in the summer may cause your feet to get too warm and since the wool retains moisture, you will start to feel hot and sweaty in your socks which will lead to you feeling uncomfortable. Generally speaking, merino wool is recommended for the spring, fall, or winter seasons because it is too insulating for the summer. When you are in the spring or summer seasons, you should look for a midweight sock. A midweight sock will provide you with enough insulation around your feet so that your feet feel warm and comfortable in the cooler seasons. A midweight sock is also great for when you are wearing socks around the house so that cool or cold floors do not bother your feet and make you feel cold. They are also thin enough to allow you to wear them with just about any kind of shoe so that you do not need to bust out the winter boots or find a slightly larger shoe so that your feet do not feel compressed by your socks and your shoes. 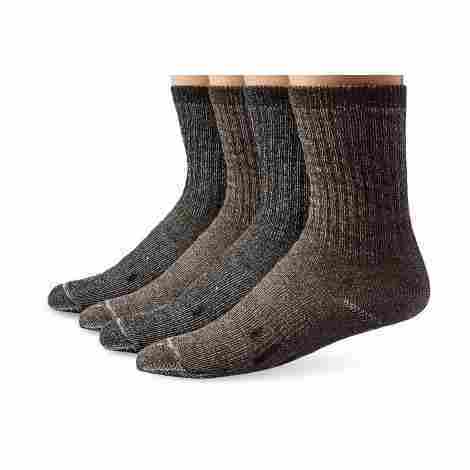 Midweight merino wool socks will allow for changes in temperatures that are often experienced in the fall and winter seasons where it is generally warmer during the daytime but gets noticeably cooler when the sun goes down in the evening and at night. When you are in the winter seasons, you will want to look for either midweight or heavyweight socks. In early and weight winter, the low temperatures may not be cold enough to justify you wearing a heavyweight sock. Merino wool does an excellent job of insulating your feet, so you may not need to wear a heavyweight sock as long as your feet feel comfortable. On the other hand, when you are going to be in the extremely cold winter temperatures or plan on being outside all day long, then you will want to go for a heavyweight merino wool sock. This is the perfect kind of sock that will give your feet more than enough insulation so that you can stay warm all day long in such conditions. As the socks get thicker, the will feel warmer so you will need to purchase Merino wool socks that have the right amount of thickness for your season. If you get socks that are too thin, then your feet will feel cold and you will not be comfortable. The opposite is also true because socks that are too thick will over insulate your feel and make you feel hot and sweaty. You should always look for socks will provide you with the maximum amount of comfort so that you feel your best while you are wearing them. Socks are sold in a variety of different heights so that you have plenty of choices when it comes to the shoes and pants that you wear with the socks. There are reasons why you might choose a sock that is shorter on some occasions while choosing a taller pair of socks for a different occasion. Not only does the height of the sock help you pick a look and feel but sometimes there are functional reasons for wanting different sock heights as well. While you are shopping for merino wool socks, you should stop and think about the height of sock that you are purchasing so that you get a pair of socks that are perfect for your needs. Sometimes there are different words for the same sock height which can become confusing. For example, the shortest sock height may be called peds, invisible socks, footies, or no-shows depending on who you purchase the socks from. These are the kind of socks that you wear when you do not want your socks to be seen at all. They are great for when you are wearing shoes such as heels, flats, or sneakers. Since invisible socks cover the smallest area of your foot, they are great for summer weather because most of the skin on your feet is not covered by the socks and can breathe naturally. If you need something that is a little bigger than invisible socks, then you should move to the next size which is the micro-crew socks, also called shorties. Micro-crew socks cover the top and the bottom of your feet and end below the ankle. Sometimes people even refer to these socks as invisible socks because they are rarely visible when you are wearing a shoe. Once again, this sort of sock is great to wear in warm or hot weather because it still allows your foot to breath. Many people even choose to wear micro-crew socks when they are active such as when they are running or playing sports. Ankle socks (mini-crew) socks are the next size up from micro-crew socks. They cover your entire foot and end around your ankle bone, which is where they get their name from. This sort of sock is popular to wear with trendy shoes such as sneakers. They also pair well with heels, flats, and women’s booties. Ankle socks are also a great choice to wear during the early fall, late spring, and even in the summer weather also long as you get a lightweight or an ultra lightweight sock so that your feet can breathe well. Next, you have the crew socks which is the most common type of sock height. A crew height sock ends around your calf muscle in your leg and is typically worn with pants. You can wear a crew sock all year round depending on the weight of the sock so they are highly versatile. Since a crew sock protects the lower part of your leg, they are a great choice of a sock to wear when you are walking outdoors because these socks will protect your legs from brush, insects, or other outdoor hazards that can irritate your skin. Crew socks work great with taller shoes and boots so if you have a pair of hiking boots you may want to consider wearing crew socks. The same is also true when you are wearing winter or work boots as well. Of course, you can wear crew socks with just about any type of shoe since they will not expose your skin if you do not want to show skin. Once you get past crew socks, you will start getting into the tall socks. You have trouser socks, followed by knew high socks, and over the knee socks. There are event thigh high socks as well if you need something that almost covers your entire leg. This sort of sock is not commonly worn but there are occasions where you may want one of these socks. For example, trouser socks are commonly worn in formal situations where you need to look your best. Many compression socks are knee-high socks which are often used by people with medical conditions or with athletes. Tall socks are also great in cold winter weather where you need insulation around your feet as well as your legs. Now that you are familiar with the different heights of socks, you will be able to pick a sock height that best suits your needs. Like all socks, merino wool socks come in different lengths which will provide you with more than enough choice while you are shopping. You should always try and get the proper height of sock so that you look and feel your best. Your shoes, clothing, and the time of the year will end up becoming important factors when you pick out the height of your socks. Comfort is one of the most important parts of a sock because nobody wants to wear a pair of socks that are not comfortable. If you have picked out the proper pair of socks, you will feel as if you are not wearing socks at all. That means that your feet will not be too warm or too cool and you won’t feel the wool scratching or itching against your skin. Your feet should feel dry and you should expect that the socks do not chafe against your skin while you are moving around. Finally, the socks should not feel as if they are squeezing your feet either. When you have a good pair of socks, they will most likely become a go-to pair of socks that are in your dresser. On the other hand, you are likely to be dissatisfied with a pair of socks that are not comfortable. One of the first things that you should check when you are determining how comfortable the socks are is how well they fit your feet. Unless you have purchased a tube sock, you will want to make sure that the pair of socks that you have purchased are properly shaped and contoured to fit your foot. In other words, you need to make sure that the socks have a distinct heel area, toe area, and arch area. These areas should also be positioned properly on your feet as well so you do not want to have the heel area of your sock around the foot of your arches. If the fit of the sock seems off, then you need to try a different size or brand of sock. One of the other things that you want to check when you are trying on a pair of socks is how tight they feel. You should want your socks to have a snug feel that is not too loose or too tight. The only exception to this rule is when you are purchasing compression socks for running or medical conditions, in which case the level of compression should be proper for the kind of sock that you have purchased. When a sock is too tight, it will start to constrict blood flow around your feet and can make your feet feel as if they are squeezed. Socks that are too loose will fall down or start to rub against your feet which will lead to chaffing and discomfort. Since merino is a species of wool, you also need to check that your socks do not scratch your feet. Merino wool is supposed to feel soft and it should not itch or scratch. This will vary since merino wool socks are rarely made completely out of merino wool. Instead, they are often made from a blend of wool and other materials. That means that your merino wool socks may have other kinds of wool blended into the sock that is not comfortable and may result in your feet feeling as if they have been scratched by the socks. Nothing is worse than feeling as if your feet are getting scratched by your socks, so you will need to make sure that the wool in the sock does not bother your skin. If the socks are bothering your skin, then you should try a different pair of socks or maybe consider a different kind of socks altogether. Wool also retains moisture so this is another area that you will need to think about when you are purchasing a pair of wool socks. Although wool breaths well naturally, the fabric also has a high moisture capacity which means that your wool socks will absorb plenty of foot sweat. In some cases, this is a good thing since this is what causes wool to insulate your feel so well and keep you warm in cold temperatures. On the other hand, a pair of wool socks may make your feet feel hot and sweaty. There are two different things that you can do in order to avoid feeling hot and sweaty when you purchase a pair of wool socks. One thing is to get a lighter weight of socks so that there are fewer wool fibers. You can also get wool blend socks that have less wool in the blend as another way to help your feet breath. Regardless of what sort of wool socks you end up purchasing, they absolutely have to feel comfortable or you are not going to want to wear the socks. That means that the socks need to have a proper fit that isn’t too loose or too tight either. They also need to properly regulate the temperature around your feet so that you do not feel cold or hot while you have the socks on. Finally, you will need to make sure that your skin can tolerate the socks so that you do not feel as if the socks are scratching your feet. Wools socks are rarely made completely from wool so chances are that you will see socks that are made from a blend of wool as well as other fabrics. One of the things that you will want to think about is what percentage of the sock is made of wool and then you will want to look at the other fabrics that are used to make the socks. Having a proper understanding of what goes into the socks will help you figure out how the socks may feel and what sort of features and benefits you can expect from your socks. The percentage of wool used in the fabric of the socks is one of the first things that you will want to take a look at while you are shopping for wool socks. While it is possible for you to find a pair of socks that are made completely from wool, this is rare and is generally undesirable. Adding additional fibers into the wool blend can add to the strength and comfort of the socks so most of the time you will see merino wool blended with fibers such as cotton, polyester, nylon, or acrylic. The amount of wool that is used in the wool blend will give you an idea as to how the socks will feel while you are wearing them. As the percentage of wool used in the fabric blend goes down, the socks start to feel softer. While merino wool is considered to be softer than other kinds of wool, it still may have a feeling of being stiff and scratchy. Therefore, wool is typically blended with soft materials that help reduce this feeling and improve the comfort of the socks. When you are shopping for a pair of wool socks, you will have to judge how the wool feels on your skin. If your skin is not tolerating a sock that has a high percentage of wool, then you can look for a pair of socks that has a lower percentage of wool. This will still allow you to leverage the many benefits of wearing wool socks while making the socks more comfortable to wear. Typically wool is blended with materials such as cotton, polyester, nylon, or acyclic. Of the three, cotton is the only fiber that is naturally occurring while the other ones are man-made. Cotton fibers come from the cotton plant and they are spun into many different textiles. When cotton is combined with wool, the garment usually becomes flexible and has a softer feel on the skin. Cotton has many benefit such as being able to breathe well and regulate your temperature so you should expect to feel good insulation while you are wearing a wool and cotton blend of a sock. One of the main advantages of blending cotton and wool together is that wool is strong and is, therefore, less likely to rip or tear. That means you get benefits of cotton and the benefits of wearing wool at the same time. However, many socks are blended with polyester rather than cotton. Polyester is a polymer based fabric which is designed to replicate the feel of cotton. It addresses many of the drawbacks of cotton such as retaining too much moisture and tearing easily. Polyester does not retain water which means that it does not insulate as well as natural fibers such as wool or cotton but it also means that the material is more moisture wicking and less likely to make your feet feel sweaty. This is why polyester is used in sports clothing. When combined with wool, polyester helps to improve the feel of the socks and it can also help lower the cost of the socks as well. Nylon is similar to polyester in that it too is a polymer-based material that does not retain water or insulate well. However, nylon is highly elastic which makes it great for compression clothing such as running socks. There is plenty of winter athletic clothing that is made from a blend of wool and nylon so that you get the feel of nylon but the insulating properties of using wool. In most cases, such clothing is primarily made from nylon and then blended with a small percentage of wool. While you are shopping for a pair of wool socks, you will want to look at what percentage of wool has been used to make the socks as well as what other materials may be blended with the socks. This will help give you an idea as to how the socks should feel while you are wearing them. Wool is typically blended with other fabrics to make the socks feel softer as well as to lower the cost of production. If you find that the feel of the wool is overpowering then you can look for a pair of socks that has less wool. On the other hand, if you want socks that will keep you warmer than the more wool that is present in the socks, the warmer you will be. As with anything that we buy, you will want to make sure that you have purchased a high-quality item. This will help to improve your overall satisfaction with your socks as well as save you money in the long run. Since wool socks tend to cost more than cotton or polyester socks, you will want to make sure that you have purchased a pair of socks that will not develop holes or fall apart at the seams. Instead, you should make sure that your socks are built to last and can be worn for years at a time. This will help you look and feel your best in your merino wool socks. When it comes to purchasing a pair of socks, there are a few problem areas that you will want to take a look at to make sure that the socks are well made. One of the first areas that you should inspect is the thickness of the sock. All socks come in different thicknesses, but you need to make sure that the thickness of the sock is applicable to what you are buying. In other words, if you are purchasing a mid-weight sock then the sock itself should feel as if it too thin for a mid-weight sock. Alternatively, an ultra-thin sock should not be thick and heavy. If the weight of the sock is off and is not accurate, then chances are that you will discover other problems with the sock. Moreover, an improper thickness of the sock will affect how long the sock will last you. Naturally, a thin sock will not last as long as a thick sock so if you are purchasing a mid-weight sock, then you should expect that it will resist developing problems such as forming holes or abrasions in the sock. The heel and mid-toe area of the socks are well known for developing holes from abrasions, so you should be on the lookout to make sure that these areas are not too thin. In many cases, the toe area of the sock will develop holes so you should also make sure that these areas are strong enough to resist developing holes. Nobody wants to wear a pair of socks where their pinky toe is poking out of the side of the toe or it feels as if there is no padding underneath the heel of their foot. Although wool is known for its durability, you should still make sure that the socks are not weak themselves. The stitching is another trouble area that tends to plague socks so you should check this out as well while you are shopping. All of the stitching on the socks matter because the stitching is what ultimately keeps the sock together. Socks have to be built to be durable since we place a lot of force on our feet while we are walking or even running. When the stitching in the socks is weak, the socks will start to develop holes and may even begin to fall apart. You should take the time to look at all of the stitching on the sock to make sure that it has been well done. There should not be any loose threads that can pull apart or unravel the stitching. The stitching of the sock should also be tight and reinforced so that pulling on the sock either from taking it on or off, walking, or washing the socks do not tear the stitching. A final problem area that you will want to check is the elasticity of the sock. Elasticity refers to how well the sock stretches and molds to your feet while you are wearing it. Your socks should maintain a snug fit around your feet and ankles and in order to do that, the socks need to stretch when you put them on and then return to their original shape when you take them off. Low-quality socks will quickly lose their elasticity while high-quality socks retain it. You can tell if the sock is losing its elasticity when you start to feel the sock falling down around your ankle or it rubs against your feet while you are walking or rubbing. Generally speaking, the loss of elasticity will mean that it is time for you to replace the socks so you want to make sure that your socks can retain elasticity for a long time. You are much more likely to purchase a good pair of merino wool socks when you check over these known problem areas. Although every manufacturer of socks has quality control and assurance procedures in place, that doesn’t mean that you should not be on the lookout for the pair of socks that made it out the door. The sooner you alert the seller to a quality problem with the socks, the better chance you have of doing an exchange or retain. Inspecting the socks up front also helps to reduce the chance that you will end up purchasing a poorly made pair of socks in the first place. Q. What is Merino Wool? A: Merino wool is made from the fur of the Merino sheep that are native to New Zealand. It is a popular wool to use in clothing because it is known for feeling soft and comfortable. Merino wool has a high water capacity which allows it to continue to insulate as it gets wet. This property of merino wool is what makes it so popular to use in clothing that is intended to keep you warm in cold weather. Q: Why doesn’t merino wool itch? A: Most wools have thick strands of fiber which do not bend really well. The fiber strands press against your skin, they will poke your skin rather than bend around it which causes itchiness in wool. The fiber strands in merino wool are much thinner than other kinds of wool so merino wool is more likely to feel softer and itch less than other kinds of wool which is why it has become so popular to use in clothing. Q: Why is merino wool blended with other fabrics? A: The main reason that wools are blended with other fabrics is that it helps to reduce the cost of production. Wool has to be farmed and therefore it is much more difficult to mass produce wool compared to synthetic fibers such as polyester, which is a man-made fabric. Adding a different kind of fabric to the wool helps to make the sock softer and it also reduces the amount of wool that is needed to make the sock as well. Q: Can I wear merino wool socks in the summer? A: If you choose to wear merino wool socks in the summertime, then you will want to go for a thin sock that has less wool in the blend. Merino wool is supposed to naturally regulate temperature on its own, but any material will start to feel hot when it is too thick for the weather. A thinner sock does not insulate as well and will, therefore, feel better in the summer as opposed to a thick sock. Q: Can I wash merino wool? A: You can wash clothing that is made from merino wool but you need to do so carefully so that you do not damage the socks. Many merino wools socks specifically say that you can machine wash the socks in cold water only and then you need to line dry the socks. Wool socks can shrink in the dryer so it is best that you do not dry your merino wool socks unless the care tag on the socks says it is ok to do so.